November | 2014 | Breathe. Sweat. Smile. Jacqueline practicing her favorite pose, handstand. Sundays 10:15am in Downers Grove. 20 years ago I started taking yoga. I was a competitive runner. I tried hard to wrap my head around the concept of centering and breathing, but my head space was not quite there yet. I dabbled in other yoga practices over the years, but it wasn’t until I stumbled into Yoga Sculpt that I felt I had found my entrance into the amazing world of yoga. Through that, I have developed a passion for the calming and restorative benefits and see how my yoga sculpt deepens my other yoga practices. I started teaching over a year ago. Taking my certification was a bucket list item for me. I had no intention of teaching. The more I learn the more I want to share and help others find the “spark” that begins their yoga practice. 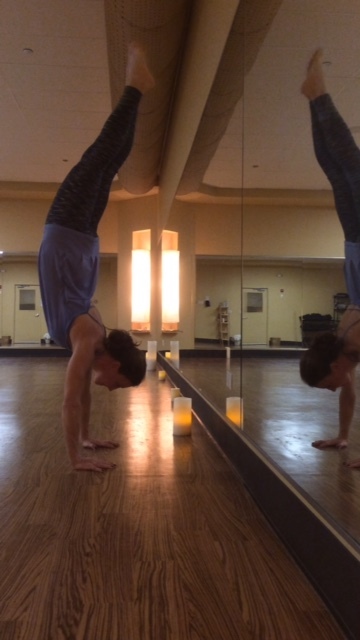 My favorite pose is Adho Mukha Vrksasana, handstand. I am obsessed with it. My ultimate goal is to pike into my handstand. I practice it or a fraction of it every day! I am inspired daily by my children and my yoga students. Both put me in the role of teacher and observer. My children serve to remind me that all of my actions no matter how benign or grand, have an impact on them and serve as a guide in their lives. My students come from so many different backgrounds with wide ranges of abilities or limitations, yet they find their way to the mat. Regardless of personal tragedies or triumphs, on the mat we are all works in progress. Show up to your mat. Everything else will fall in to place. We all started somewhere. There is a point in everyday when you are forced to make the decision to show up. Work in Progress. It works on every living thing regardless of age or circumstance. We should always strive to be a work in progress. 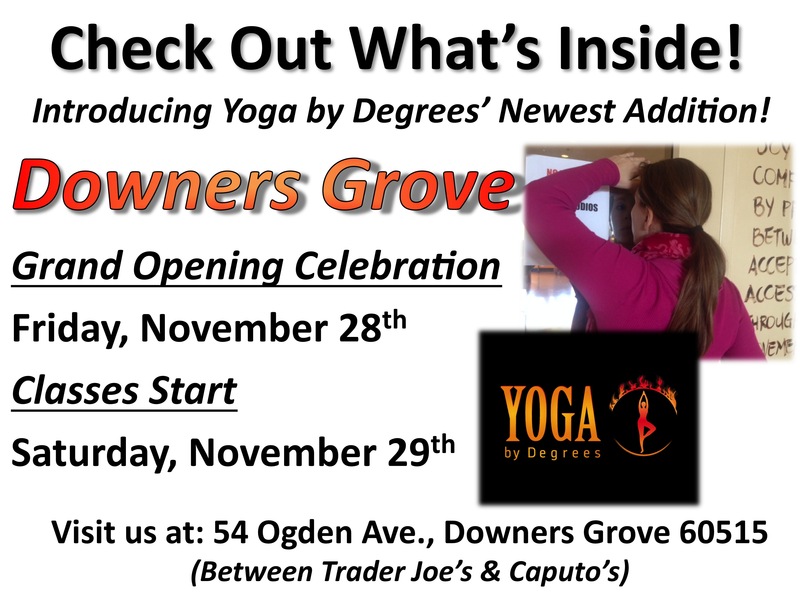 Downers Grove Studio Grand Opening! Heather demonstrating Supta Virasana, Reclined Hero Pose. Her variation with the overhead grip stretches the shoulders and heart space.